There are three official regions of Fukushima Prefecture from west to east - Aizu (bordering with Niigata Prefecture), Naka-dori and Hama-dori on the eastern coast. The word 'Fukushima' is probably now forever linked to events of March 2011 over on the east coast of the Prefecture - SnowJapan covered that incident here. The skiing and snowboarding regions of Fukushima Prefecture are mostly located well over 100km from the coastline. There are over 20 ski and snowboard resorts in Fukushima Prefecture. 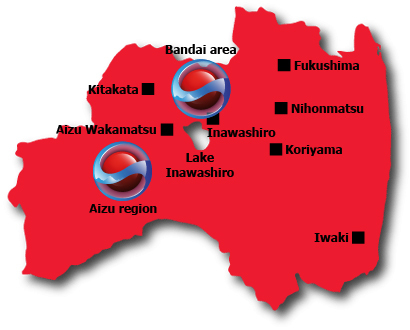 Almost all of them are in the western mountainous region - Aizu - on or nearby Mt Bandai to the north of Lake Inawashiro. Most of the rest can be found to the south west of Lake Inawashiro.